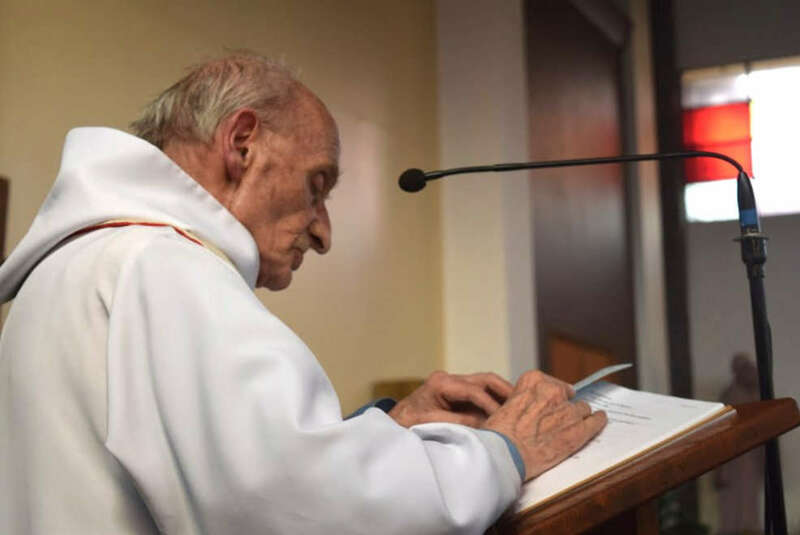 Whispers in the Loggia: On Triumph of the Cross, Pope Leaves No Doubt: "Father Hamel Is Blessed"
On Triumph of the Cross, Pope Leaves No Doubt: "Father Hamel Is Blessed"
Six weeks after Fr Jacques Hamel was murdered at the altar during morning Mass in a savage attack claimed by the Islamic State, the 85 year-old French cleric was commemorated today at another intimate “parish” Eucharist – the Pope’s daily liturgy in the chapel of his residence, the Domus Sancta Marthae, during which Francis expressly placed the priest’s killing as the newest of "this chain of martyrs" who, over two millennia, have "suffer[ed] in prison, with death, torture, for not denying Jesus Christ. 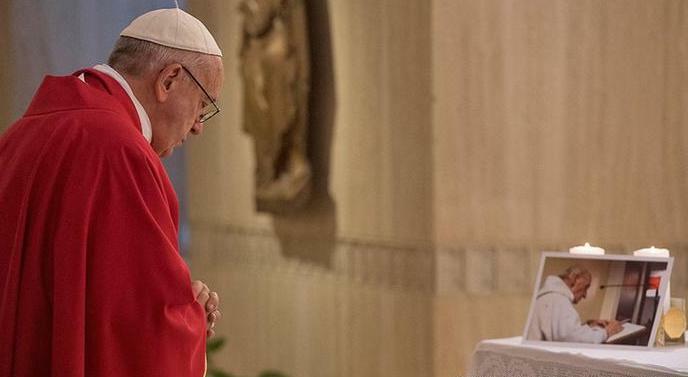 "This cruelty that asks for apostasy is – let’s say the word – satanic," the Pope said, emphatically repeating twice more that "to kill in the name of God is satanic." Yet while the pontiff made no bones about the magnitude of Hamel's example during his homily, he later confirmed a major point he merely hinted at in the preach: in a private conversation with Hamel's ordinary, Archbishop Dominique Lebrun of Rouen – who led a diocesan group of 80 attending the Mass – the French prelate later told reporters that Pope had called for a local devotion to the assassinated priest, a statement which (despite the lack of a formal process) is tantamount to beatification, the step before sainthood. Though martyrs are traditionally beatified without the requirement of a first miraculous healing, in practice the declaration comes only after the usual, years-long examination and affirmation of the person’s heroic virtue in life, then a formal finding by the Congregation for the Causes of Saints of their martyrdom in odium fidei ("out of hatred for the faith"). According to Lebrun, Francis insisted that a photo of Hamel (above) be placed on the altar for the Mass, explaining afterward to the archbishop that "he is already [a] blessed." In light of the judgment, the Pope likewise encouraged the prelate to place images of Hamel in his churches – again, a privilege normally reserved for those whose cultus has officially been recognized through their beatification, hence the oft-used phrase that a saint or blessed has been "raised to the altars." Clearly aware of that centuries-old understanding, Lebrun said the pontiff added that "if anyone says you don't have the right to do it, tell them the Pope gave you permission." While it is unclear whether Francis – who has previously exercised his prerogative to effect several "equipollent" canonizations, thus formalizing widely-recognized sainthoods without the usual second miracle – will move to make his comments official with a legal document, as beatification normally sees the blessed's life marked with the assignment of a feast day, Hamel's would need to be celebrated on a date other than that of his 26 July murder due to the calendar's conflict with the feast of Saints Joachim and Anne, the grandparents of Jesus. Beyond the sheer emotion of the priest’s murder and the unique Vatican tribute, the significance of Francis' memorial Mass was made even more auspicious by its choice of timing: today’s feast of the Triumph (or Exaltation) of the Cross, the ancient celebration of the instrument of Christ’s suffering and death, which was instituted following several events related to the cross' reputed finding in the 4th century. Most pointedly of all, however, given the circumstances of Hamel's assassination and the history of the cross' discovery by St Helena, the mother of Constantine, this feast is likewise an observance linked at its very core to the Christianization of Europe. Signaling Francis’ intent for the Mass to be joined by a congregation outside its walls – and, indeed, for his own message to be heard – Vatican TV aired and streamed a Domus liturgy live in its entirety for the first time. Much as the standard drip of heavy excerpts from the pontiff’s unscripted morning homilies continues to spark all kinds of reactions on a regular basis, a full daily preach from Santa Marta has only been released on one other occasion: the July 2014 Mass the Pope celebrated for victim-survivors of sexual abuse by clergy, at which Francis begged forgiveness for the crimes and pledged the enhanced accountability of superiors in their handling of cases. The early Christians confessed Christ by paying with their lives. The early Christians who were asked to confess other gods, to say that ‘our god is true and not yours,’ when they refused to do this, were crucified. This story is repeated through today. Today, in the Church, there are more martyrs than martyred Christians in the past. In this history, we get to our Father Jaques: he is part of this chain of martyrs. Christians who today suffer in prison, with death, torture, for not denying Jesus Christ, show precisely the cruelty of this persecution. This cruelty that asks for apostasy is – let’s say the word – satanic. He gave his life to not deny Jesus, gave his life in the same way Jesus [does] on the altar. And from there, he accused the author of persecution: “Go away, Satan!”. May this example of courage, along with the martyrdom of his life to empty himself to help others, help us to move forward without fear. We must pray, eh! He is a martyr, the martyrs are blessed … We must pray he gives us brotherhood, meekness, peace, and even the courage to tell the truth: to kill in the name of God is satanic. "Yes, America, All This Belongs To You...."